Actually, I wanted to share a good news to all fellow Indian readers since the beginning of this week but somehow it got delayed. In order to attract more customers, Amazon periodically brings in new offers in India. And, we at ThinkerViews keep an eye on such stuff and share it with our reads, so the maximum users can take advantage of it. Here are quick links to some such offers we’ve shared recently. Today let me share an interesting offer regarding audio books. 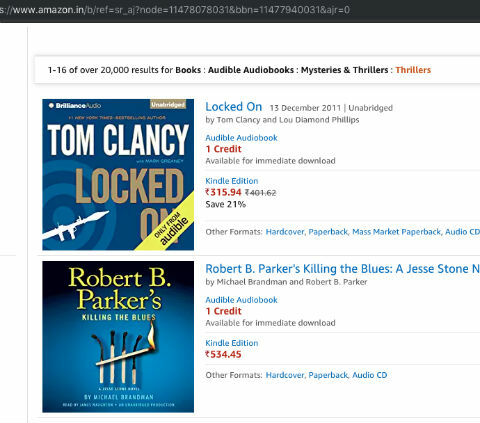 It is not very trendy in India yet, but, audiobooks are very popular in some of the countries. It helps people to keep doing other works while listening to the book. So it serves a dual purpose. Some people hear it while on a long drive or jogging or doing other such physical activity. Walking for while barefoot in the green lawn while listening to an audiobook benefits both physical and mental health. One of our team members is a good audiobook listener and it resulted in some of the most popular book review articles at ThinkerViews. Audible is an Amazon venture where you can find some of the really nice audiobooks. The narrator must have a good command of English. Of course, pronunciations play a vital role in the effectiveness of the book. Usually, all the voice actors who are in this field have mastered this art. The only problem I came across occasionally is about the relevancy. Often, the narrator cannot relate to the culture, time, surrounding and the way of living of the book characters. Until and unless you understand the context of the story, you may not be that convincing. Anyway, let us continue talking about the offer Amazon came up with. 1 audiobook per month free for 90 days. After 90 days, ₹199 per month. There is a provision to cancel it anytime. After 30 days, ₹199 per month. In either of the cases, you can discontinue/cancel the membership anytime. The good thing is, when you cancel the audible membership, the books you bought will remain yours. Once to collect any of the above-mentioned offers and join the program, you can browse the catalog. As you know, Prime Members, get 1 free credit for each of the first 3 months of their membership (so total 3 free credits). Along with each book there mentioned a price or the credit required to purchase it. So you can choose your desired one and pay by credit (to claim the free credit you’ve received). There are some exclusive audiobooks which may attract you. The membership is actually free (as per the effective offer to you), but in order to complete the purchase, you need to pay INR 2 (Rs. 2) while checking out. These charges will be refunded into 48 hours. It will be interesting to know that you cannot pay the charge (Rs. 2) using Amazon pay balance! You need to pay it by using other payment options. 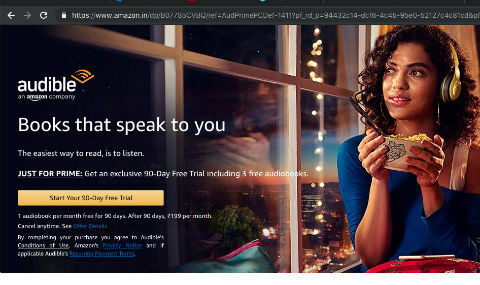 Indirectly Amazon India offers 90 days free trial (to Prime members) – that is worth Rs. 597.00. Here are some interesting points mentioned on the Terms/Conditions page. Members get over 350 mins of handpicked listens for free, in addition to the monthly credit. You own your audiobooks. Keep your audiobooks forever, even if you cancel. Easy exchanges. Don’t like the book? Swap it for free. Here are two quick links for you.